This is a simple and fool proof recipe for Alfredo sauce that’s rich and creamy. Sue Chef and Baker’s Man created it one day when we had no jars of Alfredo Sauce in the house. This recipe creates a quick and delicious sauce, and once you’ve made this homemade version, you will never buy the Alfredo sauce in jars again. Everyone thinks that Alfredo sauce goes best with fettuccine. 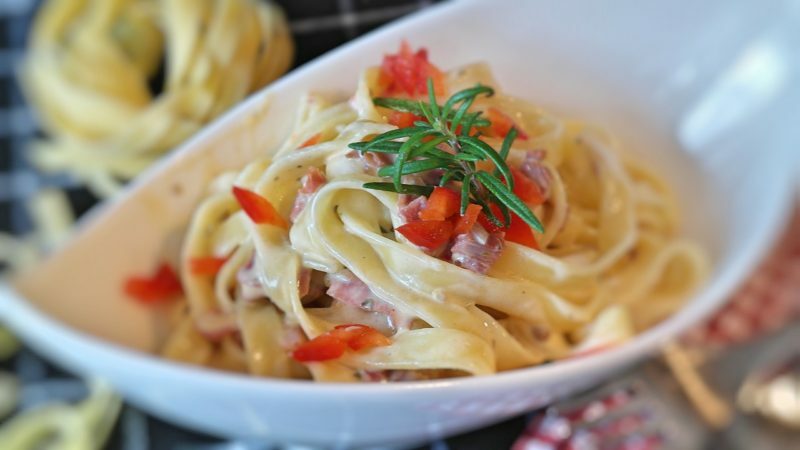 It’s quite good that way, and our photos show it served with fettuccine, but we believe that Sue Chef’s Alfredo Sauce is best served over a pasta that really holds onto the sauce like penne or farfelle. To be honest, we serve it with whatever type of pasta we have on hand. We’ve even served it with ravioli, and we’ve used it on pizza. Alfredo is one of Food Critic’s favorite dishes, so this recipe makes him very happy. We’re happy that it’s made from things we almost always have in the house. There’s no need for cream or half and half with this recipe. Cream cheese, which we almost always have in our fridge, and milk are the base for this sauce. We love how this simple recipe can be modified through the addition of finely chopped herbs, diced vegetables, cooked chicken, shrimp, or even diced ham, to create a completely different dish. The plated pasta can be garnished with finely diced tomatoes or peppers along with some fresh herbs. 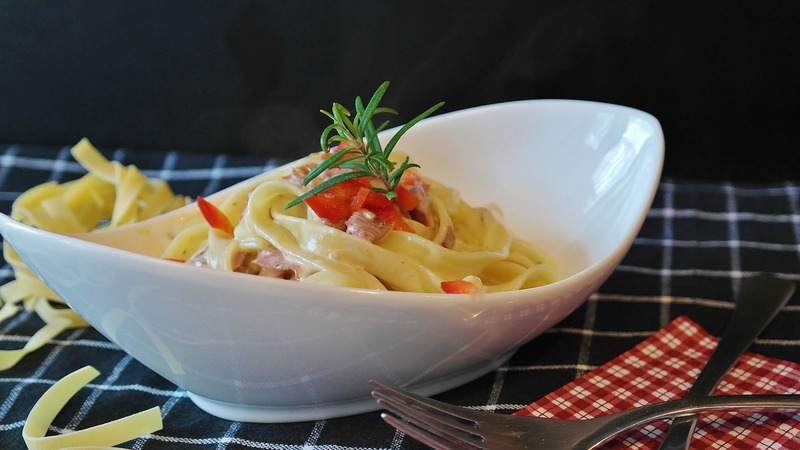 Sue Chef’s Alfredo sauce is very versatile and can be the base for many different dishes depending upon what you add, and it’s amazing served in its unadulterated form because it’s so rich and creamy. 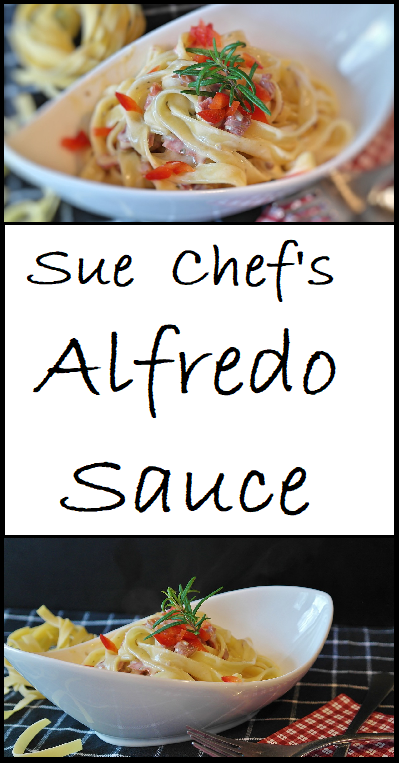 Give Sue Chef’s Alfredo Sauce Recipe a try, and let us know what you think by leaving a comment below. This simple and fool proof recipe for Alfredo sauce is rich and creamy. It's also quick and delicious. If you prefer a more garlicky flavor, add 2 teaspoons of granulated garlic. If you prefer, you can add some finely minced fresh garlic to the oil and melted butter just before you add the cream cheese in place of the garlic powder. To decrease the calories in this recipe, the sauce can be made with neufchatel cheese and non-fat milk without compromising the flavor. Total Cost of this Recipe is $4.62 or $0.58 per serving. Melt butter with olive oil in a sauce pan over medium heat. Add granulated garlic and stir until well incorporated. Add milk, a little at time, stirring to smooth out any lumps. Stir in the Parmesan cheese and the black pepper. Remove from heat when cheese is melted and sauce reaches the desired consistently. Stir frequently, this sauce will stick to your pan if left unattended. Serve with, or serve over, your favorite pasta or ravioli. Nutrition information is for 1/2 cup of sauce without pasta.